Trying to figure all this out. I have a 2009 Carrera 4. Manual states AWD controlled fluid and PDK clutch fluid at 60K, and transmission fluid and final drive fluid at 120K I really just want to know what to change, with what fluid, and when and Porsche could not make it more complicated. 1 - PDK clutch fluid - about 5L of the FFL3 stuff and you need a PIWIS - check - dealer did this 2 - AWD controlled stuff - in the repair manual they have a clutch and a differntial listed on the front final drive - with a capacity of .9L - what fluids go in there? 3- final drive - capacity 1.5L, needs changed at 12 years/120,000 miles - what fluid goes in there? And this is part of the PDK transmission? So there are 3 fluids in the PDK? 4 - PDK transmission fluid - capacity 9L (change capacoty of 4.5L) needs done at 12yr/120,000 miles - what fluid goes in there? 1999 3.4 996 Cab rear quarter windows up with top down? Yes. Push the microswitch on the latch when the top is down. You need a pen or screwdriver. Then you can raise the rear windows. 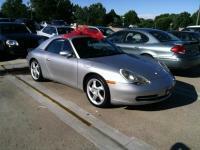 2009 Carrera 4 Cab, 997.2 So looking at the maintenance schedule it calls for the AWD controller oil at 6yr/60K. I bought the manuals and I am trying to piece this together. The manual describes 3 possible oil changes and non of them are called AWD controller. There is the front diff, the front diff clutch, and the front final drive (which is actually on the transmission). The AWD controller is the clutch in the front diff and takes .9L of special 75w/80 Porsche oil? As an aside, the front diff in the 997.2 Carrera 4 is the same as in all the 997 turbos? But not the same as the front diff on the 996 and 997.1's? I just got one. After my expenses with 996 ownership I went the CPO route to start my 997 ownership. They have a bunch of 08 and 09 CPO cars if you are concerned about maintenance. What happened to the TSB access? I see the list but I can't open them. Something change in my absence? http://www.renntech.org/forums/topic/47431-rear-window-rubber-seal-for-2002-c4-cab/?hl=%2Brear+%2Bwindow+%2Bseal I had to replace #2 and #3 to stop the leak. I did both sides to be sure. Take off the speaker cover, take off the rear wheel, and remove the wheel well liner. You should be able to see the whole system. The drain in the wheel well is probably clogged. To get the carpet up enough to dry it you have to remove the rear inner panel also. My car also had a leak on the front seal for the rear window that needed replaced. Did that last year. Didn't help. But I learned that I need glasses. Last winter key "click"after turing off the car when the car was cold. The car truned off and the key comes out, but you can't put the key back in until you hear the "click". And the interior lights stay on until then. So last summer replaced the switch only. This winter problem was the same/worse. So I am going to replace the entire machanism this summer. So did my reasearch I found these two posts for replacement. http://www.6speedonline.com/forums/996-turbo-gt2/260947-key-hard-remove-ignition-lock-2.html#post3395412 http://www.pelicanparts.com/techarticles/Porsche-996-997-Carrera/86-ELEC-Replacing_Your_Ignition_Switch_Steering_Lock/86-ELEC-Replacing_Your_Ignition_Switch_Steering_Lock.htm I know this is a dumb question, but are these the same job, one from the top and one from the bottom? The pelican way looks much easier. No removal of anything necessary. The switch is where the hook goes into the latch above the windshield. By the overhead light. You need a little screw driver to press it in. Unless you have small fingers. I had a new AOS installed (OEM) when I did the IMS bearing. Less than 5000 miles and it failed and had to be replaced. Also, according to the secret menu I don't think I have a low temp themostat. Temp rises linearly to 191 degrees then rapidly drops back to 183 degrees and then stays within a few degrees of this. I have a complete spare for the parts you need. Ordered another deck and while disassembling the original I took apart them mechanism and have a complete understanding of how it works. Let me know if you still need help/parts.